The United States Coast Guard Auxiliary (USCGAUX, CGAux, or USCG Aux) is the uniformed auxiliary service of the United States Coast Guard (USCG). Congress established the USCG Aux on June 23, 1939, as the United States Coast Guard Reserve. On February 19, 1941, the organization was re-designated as the United States Coast Guard Auxiliary. The Auxiliary exists to support all USCG missions except roles that require "direct" law enforcement or military engagement. As of 2018, there were approximately 24,000 members of the U.S. Coast Guard Auxiliary. Collectively the Auxiliary contributes over 4.5 million hours of service each year and completed nearly 500,000 missions in service to support the Coast Guard. Every year Auxiliarists help to save approximately 500 lives, assist 15,000 distressed boaters, conduct over 150,000 safety examinations of recreational vessels, and provide boater safety instruction to over 500,000 students. In total the Coast Guard Auxiliary saves taxpayers hundreds of millions of dollars each year. The development of the single-operator motorboat, and later the outboard engine, during the early 20th century increased the number of recreational boaters operating on United States federal waters. By 1939 there were more than 300,000 personal watercraft in operation. The previous year the Coast Guard had received 14,000 calls for assistance and had responded to 8,600 "in-peril" cases. The Coast Guard Reserve Act of 1939 was passed by the United States Congress creating a civilian reserve force for the United States Coast Guard that would have four specified responsibilities. They were charged with promoting safety at sea, increasing boater efficiency for American citizens, assisting them with laws and compliance, and supporting Active Duty members of the Coast Guard. This encompassed boat owners being organized into flotillas within Coast Guard districts around the United States. They conducted safety and security patrols and helped enforce the 1940 Federal Boating and Espionage Acts. In 1941 Congress passed a law to restructure the Coast Guard Reserve which was created just two years earlier. The Coast Guard would hence forth have two reserve forces. The existing civilian organization would be renamed the Coast Guard Auxiliary. In addition, the Coast Guard Reserve was created that year and would have military and law enforcement responsibilities. During World War II many Auxiliarists became temporary members of the Coast Guard Reserve. Coast Guard Headquarters issued policies allowing some of those boats to be equipped with machine guns and they could carry pistols and rifles on patrols. In 1941 the Coast Guard, Coast Guard Reserve, and Coast Guard Auxiliary were transferred from the United States Treasury Department to the United States Department of the Navy  and in 1942 the Coast Guard Auxiliary was authorized to wear military uniforms. During the war Auxiliarists would help the Coast Guard with recruiting and training active duty personnel. Beginning in 1942, in response to the growing German U-Boat threat to the United States, the U.S. Navy ordered the acquisition of the "maximum practical number of civilian craft in any way capable of going to sea in good weather for a period of at least 48 hours." A large number of vessels, owned and piloted by Auxiliarists with crews made-up of Coast Guard reservists, made-up the bulk of the American coastal anti-submarine warfare capability during the early months of World War II (the so-called "Corsair Fleet"). As newly constructed warships took over the load, the Coast Guard abandoned the concept. None of the two thousand civilian craft, armed with depth charges stowed on their decks, ever sank a submarine, though they did rescue several hundred survivors of torpedoed merchant ships. From 1942 through the rest of the war Auxiliarists and Coast Guard reservists served on local Port Security Forces to protect the shipping industry. Auxiliarists in 1967 rescuing a boater off an outboard that had foundered during a storm in Long Island Sound, New York. In 1950 National Commodore Bert Pouncey was elected and the National Board for the Coast Guard Auxiliary was established. In 1955 Auiliarists started to participate in programs to support the recruitment of potential candidates for the United States Coast Guard Academy. The North American Boating Campaign was originally known as "Safe Boating Week," observed by the Coast Guard Auxiliary as a courtesy examination weekend in Amesbury, Massachusetts in June 1952. This tradition continued until 1957 when an official National Safe Boating Week observation took place sponsored by the United States Coast Guard Auxiliary in various parts of the country. As a result, the U.S. Coast Guard prepared a Resolution, and on June 4, 1958, President Dwight D. Eisenhower signed PL 85-445, to establish National Safe Boating Week as the first week starting on the first Sunday in June. Early in 1973, budget cuts forced the closing of seven Coast Guard stations on the Great Lakes. At the request of the affected communities, Congress ordered the stations to be re-opened and operated by the Auxiliary. The local division captains took responsibility for manning them and ensuring that Auxiliarists' boats were always available to assist distressed vessels. The Auxiliary later took over seven more stations on the Mississippi and Ohio Rivers. In 1976 the Coast Guard commissioned a study of the Auxiliary by a private research firm, University Sciences Forum of Washington. After interviewing key personnel in the Coast Guard and the Auxiliary and analyzing questionnaires filled out by about two thousand Auxiliarists, the researchers concluded that the Auxiliary was in good health. "In summary," they wrote, "we consider the Auxiliary the greatest economical resource readily available to the COGARD. It performs in an outstanding manner and its personnel are among the most professional group of volunteers in the nation." Under Congressional legislation passed in 1996, the Auxiliary's role was expanded to allow members to assist in any Coast Guard mission, except direct law enforcement and military operations. As of 2004, the Coast Guard Auxiliary had 35,000 members who collectively provided 2 million man hours of service annually. In 2003 the Coast Guard, Coast Guard Reserve and Coast Guard Auxiliary were realigned to be under the United States Department of Homeland Security. As of 2004, the Coast Guard Auxiliary had 35,000 members who collectively provided 2 million man hours of service annually. On June 19, 2009, the Commandant of the Coast Guard awarded the Coast Guard Unit Commendation to Auxiliary members for "performance ... nothing short of stellar" from the period of June 24, 1999, to June 23, 2009. On the 75th anniversary of the USCG Auxiliary, June 23, 2014, the Commandant awarded another Coast Guard Unit Commendation ribbon to all Auxiliarists. Above all, the Auxiliary serves as a force multiplier for the Coast Guard. Auxiliarists promote safety, security, and assistance for the citizens of the United States in the harbors, seaports, coasts, canals, and rivers across the country. The wholly delegated to the Auxiliary its mission of promoting and improving recreational boater safety. The Auxiliary also directly supports active duty and reservists in carrying out search and rescue, marine safety, waterways management, environmental protection, and homeland security missions. The Auxiliary's most prominent role is promoting recreational boating safety ("RBS") among the general public. The Auxiliary has several distinct programs that support this mission. Providing free Vessel Safety Checks (formerly "Courtesy Marine Examinations") to recreational boaters is one of the Auxiliary's longest running and most visible activities. Through the Public Education program, Auxiliary instructors deliver a range of courses on boating-related topics such as seamanship, knots, laws and regulations related to boating, weather, and navigation. RBS Partnership Program Visitors (formerly "Marine Dealer Visitors) serve as liaisons between the Auxiliary and interested local businesses/organizations (such as marinas, boating clubs, etc.). The badge of the U.S. Coast Guard Auxiliary University Programs unit at the College of William and Mary. The Auxiliary University Programs (AUP) is a Coast Guard Auxiliary-managed initiative established in 2007. Today AUP now has nearly 200 members in 11 units representing over 30 colleges and universities across the United States. AUP prepares undergraduate and graduate students for future public service inside and outside of the Coast Guard Auxiliary. Intended to function in a manner similar to ROTC programs, AUP provides students exposure to Coast Guard careers without requiring a service commitment, and more generally teaches students seamanship and leadership, and encourages public service. AUP has a positive track record of getting a large number of its graduates into Coast Guard Officer Candidate School and also offers an Internship Program. The Coast Guard Auxiliary Interpreter Corps provides auxiliarists who are fluent in languages other than English for assignments with both the regular Coast Guard, and other branches of the United States military, to support domestic and overseas deployments that require language and translation assistance. The Interpreter Corp certifies on two levels of competencies and directly supports the Coast Guard International Affairs Department. In recent years auxiliarists from the Interpreter Corps have deployed in support of the Africa Partnership Station, Tradewinds, and other missions. According to the Coast Guard, there are currently 440 auxiliarists in the Interpreter Corps, representing 48 languages. The Coast Guard, which has just one regular military band, relies on Auxiliarist musicians for ship christenings, and change-of-command ceremonies. In addition, the United States Coast Guard Pipe Band is formed from both Coast Guard Reserve and Coast Guard Auxiliary members. In addition, Auxiliarists may serve in the Color Guard at community events and funerals where they can present the flag and colors after getting approval from their chain of command. The U.S. Coast Guard Auxiliary is divided into three geographic areas: Pacific, Atlantic West, and Atlantic East. The three areas are subdivided into district and divisions, with the smallest unit of organization being the flotilla (not represented on this map). The Coast Guard Auxiliary is situated in the Coast Guard's Office of Auxiliary and Boating Safety (CG-BSX), Auxiliary Division (CG-BSX-1), with the office of the Deputy Commandant for Operations (CG-DCO) in Coast Guard Headquarters. CG-DCO oversees the Assistant Commandant for Marine Safety, Security, and Stewardship (CG-5) who in turn oversees the Director of Prevention Policy (CG-54), who in turn oversees CG-542. The Auxiliary has units in all 50 states, Puerto Rico, the Virgin Islands, American Samoa, and Guam. Under the direct authority of the U.S. Department of Homeland Security via the Commandant of the U.S. Coast Guard, the Auxiliary's internally operating levels are broken down into four organizational levels: Flotilla, Division, District and National. Flotillas: A Flotilla is the basic building block of the Auxiliary. While a flotilla should have at least 10 members, several flotillas have more than 100 members. Most of the day-to-day work of the Auxiliary is performed at the flotilla level. All members join the Auxiliary at the flotilla level and pay their annual membership dues to their flotilla, which normally meet on a monthly basis. Visitors and prospective members are usually welcome to attend. Divisions: At least four (4) flotillas form a Division, which provides leadership, direction, and staff assistance to the flotillas so that their programs can run effectively. Districts/Regions: There are several divisions in a District. The District provides leadership and staff assistance to the Divisions. Each Auxiliary District is supervised by a Director of the Auxiliary who is an Active Duty Coast Guard officer usually holding the rank of Commander. Auxiliary Districts generally coincide with Coast Guard Districts. Areas: Three Deputy National Commodores are responsible for three geographic areas: Atlantic East, Atlantic West, and Pacific Area, respectively. National: The Auxiliary has national officers who are responsible, along with the Commandant, for the administration and policy-making for the entire Auxiliary. These include the National Executive Committee (NEXCOM) that is composed of the Chief Director of Auxiliary (CHDIRAUX – an active duty officer), the National Commodore (NACO), the Immediate Past National Commodore (IPNACO), Vice National Commodore (VNACO), and the four Deputy National Commodores (DNACOs) which in turn is part of the National Staff Operating Committee (OPCOM). OPCOM consists of twenty-nine (29) members: eight (8) NEXCOM members listed above, National Executive Staff consisting of seven (7) Assistant National Commodores (ANACO), and fourteen (14) Directorate Directors (DIR). These individuals along with their respective staff in the various national directorates make up the Auxiliary Headquarters organization. The Chief Director is a senior Coast Guard officer and directs the administration of the Auxiliary on policies established by the Commandant. The overall supervision of the Auxiliary is under the Deputy Commandant for Operations (CG-DCO), who reports directly to the Commandant (CCG). The Coast Guard Auxiliary does not have a military chain of command. There are, however, two chains of leadership and management. Auxiliarists are expected to adhere to the relevant chain when communicating. There is an elected leader chain and an appointed leader chain (known as "parallel staffing"). Commanders and vice commanders (deputies) of each flotilla, division and district are elected annually. The national leadership is elected once every two years. Other staff officers are appointed based on skills and level of interest. All leadership positions in the Auxiliary require membership in a Flotilla of the Auxiliary. The National Commodore of the United State Coast Guard Auxiliary (NACO) is the most senior and principal officer of the United State Coast Guard Auxiliary. The national commodore represents the Auxiliary and reports to the commandant of the Coast Guard through the Vice Commandant of the Coast Guard. Additionally, the National Commodore represents the Auxiliary with all Coast Guard flag officers and flag officer equivalent civilians at Coast Guard headquarters on Auxiliary matters. The National Commodore functions to support the Commandant's strategic goals and objectives and serve auxiliarists. Vice National Commodore (VNACO) – The VNACO is the Chief Operating Officer of the Coast Guard Auxiliary and reports to the National Commodore (NACO). Additionally, the VNACO represents the Auxiliary at the direction of the NACO with all Coast Guard Flag officers and Flag officer equivalent civilians at Coast Guard Headquarters on Auxiliary matters. Deputy National Commodore (DNACO) – The Auxiliary has four Deputy National Commodores (DNACO) who report to the Vice National Commodore. Three are elected (Mission Support, Operations, and Recreational Boating Safety), and one is appointed (Information Technology and Planning). Each DNACO has a specific set of operational areas of responsibility to include one or more of the appointed Assistant National Commodores (staff officers). Additionally, each of the three elected DNACOs are the reporting point for approximately one third of the 16 District Commodores, grouped by geographical area, who are elected every two years to lead their local membership. Assistant National Commodore (ANACO) – Seven Assistant National Commodores form the National Executive Staff and are appointed to either lead multiple national directorates or perform specialized roles (such as Chief Counsel or Diversity). They are expected to consult and coordinate with appropriate Coast Guard Flag officers and program managers in coordination with the Chief Director to determine requirements for Auxiliary resources used within their areas of responsibilities and develop and manage Auxiliary programs consistent with Coast Guard needs and objectives. Director (DIR) – Directors are responsible for the Auxiliary's national directorates. Within each directorate are a Deputy Director (DIRd) and Division Chiefs (DVC), who in turn supervise Branch Chiefs (BC). Within each branch a Branch Chief may have Branch Assistants (BA) to support branch activities as well. 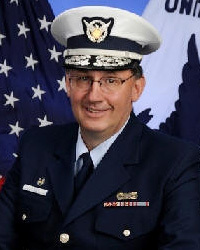 District Director of the Auxiliary (DIRAUX) – An active duty Coast Guard officer who is dedicated full-time to Auxiliary functions in his or her district. The DIRAUX has sole responsibility for enrolling a new member or for disenrolling an existing member. The DIRAUX is also the final authority in all matters related to his or her Auxiliary district. District Commodore (DCO) – The highest elected level within the district, this office supervises all Auxiliary activities within his or her district, and is elected by the Division Commanders within the district. District Chief of Staff (DCOS) (Formerly District Vice Commodore [VCO]) – The district's Chief of Staff and Assistant to the District Commodore. Elected by the Division Commanders in the district. District Captains (DCAPT) (Formerly District Rear Commodore [RCO]) (two or more per district) – Elected by all Division Commanders and usually supervise a group of divisions in a district. They may also have programmatic responsibilities. 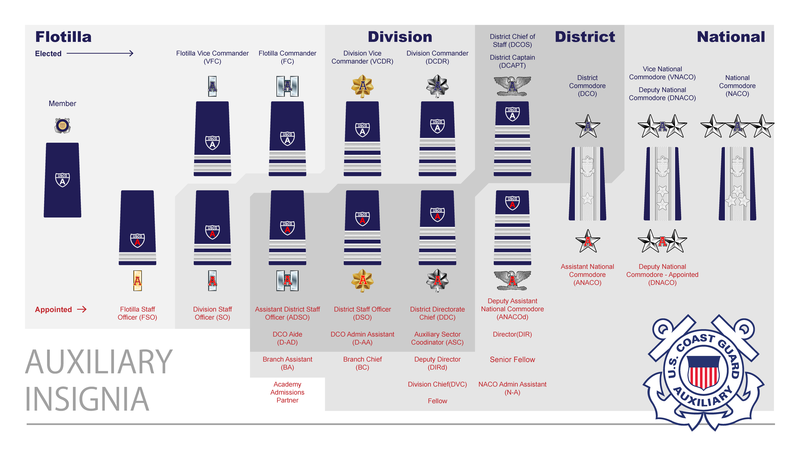 District Directorate Chiefs (DDC) – Some districts appoint DDCs based on the three major areas of Auxiliary activity (i.e., Prevention, Response, and Logistics). They are appointed by the DCO and approved by DIRAUX. District Staff Officers (DSO) – Manage the district's departments and programs; appointed by the DCO and approved by DIRAUX. Assistant District Staff Officers (ADSO) – Assist with the management of district departments under the direction and guidance of the DSO; appointed by the DCO with concurrence of DCOS. Division Commander (DCDR) (formerly Division Captain) – The highest elected Auxiliary leader within a division. Elected by the Flotilla Commanders in a Division. Division Vice Commander (VCDR) – Division Chief of Staff and assistant to the Division Commander. Elected by the Flotilla Commanders in a division. Division Staff Officers (SO) – Manage the division's departments and programs; appointed by the DCDR. A U.S. Coast Guard Dolphin HH65 helicopter trains in basket hoisting with Coast Guard Auxiliary vessels and auxiliarists near Los Angeles, California in about 2009. Titles and duties of flotilla officers are dictated by the Auxiliary Manual. Flotilla Commander (FC) – The highest elected Auxiliary leader within a flotilla. He/she is elected by the members of a flotilla. Recommends new members for enrollment to the DIRAUX. Flotilla Vice Commander (VFC) – The flotilla's Chief of Staff and assistant to the Flotilla Commander. Elected by the members of a Flotilla. Flotilla Staff Officers (FSO) – Responsible for managing the flotilla's departments and programs; appointed by the FC. Detachment Leader (DL) – Serves as the leader for a DIRAUX approved flotilla detachment. This officer is appointed by the FC and wears the insignia of an FSO. To carry out the Auxiliary program, DCDRs and FCs may appoint flotilla and division staff officers. The DCO may appoint district staff officers. A staff officer at the flotilla level is abbreviated FSO; at the division level, SO; and at the District level, DSO. Thus, the SO-CS is the Division Communications Services officer. Auxiliarists are expected to wear a uniform intended for the situation and mission. Each auxiliary uniform is identical to a Coast Guard officer's military uniform, with the exception that the buttons and stripes on dress jackets and shoulder boards are silver in color, rather than gold. On dress uniforms, appointed staff officers wear insignia with a red "A" and elected officers wear insignia with either a silver or a blue "A", while black "A"s are worn on insignia by both elected and appointed officers on the ODU uniform. Auxiliarists are expected to adhere to the same rules of correct uniform wear as regular and reserve Coast Guard officers. When augmenting Coast Guard personnel aboard a vessel at sea, the military-style insignia of Auxiliary position is generally removed and the organizational insignia is worn. This is done to prevent confusion by foreign entities, other agencies, or hostiles as to who is in command on the vessel. Auxiliarists do not have military rank, but they do wear military rank-style insignia that signify their office (e.g., a Flotilla Commander wears insignia similar to a USCG lieutenant, but is not referred to as "Lieutenant"). All members are referred to as "Auxiliarist" unless their leadership position is equivalent to that of a flag officer, in which case they are referred to as Commodore. The title most commonly used in official correspondence and reports is "Auxiliarist", and its abbreviation (e.g., Auxiliarist John Smith or AUX J. Smith). Exceptions to this rule are elected or appointed Commodores, who have reached flag positions similar to active and reserve rear admirals and vice admirals and who wear one to three stars depending on their office (e.g., District Commodore, Assistant National Commodore, Deputy National Commodore, or National Commodore); specifically, they may use the term Commodore, and are the only Auxiliarists who use a military style title ("Commodore") before their name, sometimes abbreviated COMO accordingly (e.g., Commodore James A. Smith, National Commodore; or COMO Jim Smith, (NACO)). The purpose of the Auxiliary's rank-style insignia is to identify the Auxiliarist's position within the organization and recognize the responsibilities of elected and appointed leaders and staff officers. Past elected and appointed leaders are authorized to permanently wear the insignia of the highest office held if they held such office for at least half of its term. When insignia no longer indicates current elected or appointed status in the office represented by the insignia, Auxiliarists must wear the past officer device. Auxiliarists do not normally render military courtesies (such as saluting) to each other, but to do so is not prohibited. An Auxiliarist in uniform is expected to initiate salutes to the U.S. national ensign and friendly foreign flags as well as military officers who are senior to the Auxiliarist's office. Enlisted personnel are not required to salute Auxiliarists, but Auxiliarists are expected to return all salutes given. I, (your name), solemnly and sincerely pledge myself, to support the United States Coast Guard Auxiliary, and its purposes, to faithfully execute my duties, and to abide by the governing policies, established by the Commandant, of the United States Coast Guard. Auxiliarists may be awarded medals and decorations of the Coast Guard or Coast Guard Auxiliary, and may wear certain medals and decorations awarded in prior military service based on what is approved in the Auxiliary Manual. There are currently 36 medals and ribbons for which auxiliarists are eligible. All auxiliarists currently on the National Staff may wear the National Staff Badge. Auxiliarists in recruiting offices and meet five requirements may wear the Coast Guard Recruiting Badge. Auxiliarists who meet the requirements of the Academy Admissions Partner Program and are approved by the Superintendent of the United States Coast Guard Academy may be entitled to wear the Coast Guard Academy Admissions Recruiting Badge. The United States Coast Guard Auxiliary offers a number of benefits and fellowship opportunities. Auxiliarists are allowed access to the Coast Guard Exchange and have opportunities for training, awards, and uniforms. Some expenses incurred by the auxiliarist may be tax deductible. Auxiliarists are allowed access to the Coast Guard Mutual Assistance Program. Auxiliary Flotillas are also supported by the Coast Guard Foundation. An Auxiliarist may be issued an official identification card by his/her local Director of Auxiliary (DIRAUX) only after the USCG Security Center completes a Personnel Security Investigation and issues a favorable suitability-for-service determination. While on official orders, if an Auxiliarist is injured or killed in the line of duty, they may be entitled to compensation on a monthly pay rate equivalent to the GS-9 on the General Schedule Payscale. The Coast Guard Auxiliary Association (CGAuxA) is a 501(c)(3) non-profit organization based out of St. Louis, MO that raises and donates money to support outreach activities of the auxiliary. According to its website, the organization was established in 1957 and supports the Auxiliary with its mission to support Recreational Boater Safety, fundraising, and provides the Auxiliary with needed supplies. In addition Auxiliary Association members have access to the Pentagon Federal Credit Union. The Coast Guard Auxiliary has also established a number of national partnerships for discounts on office supplies, hotels, rental cars, prescriptions, and insurance. The Auxiliary Association is led by a ten-member Board of Directors that receives no compensation. Auxiliarists are automatically extended a free membership to the Auxiliary Association. Potential applicants must be a United States Citizen, be at minimum 17 years of age, and prior members of the United States Armed Forces must provide proof that they were discharged at minimum under honorable conditions. Applicants must have never committed a felony and have a social security number that is valid. While the auxiliary attracts boat owners and veterans of the Armed Forces, neither of which are requirements to join and are common misconceptions. Sea Scouts are eligible to join at age 14, under an exception granted by agreement between both organizations. In order to qualify for membership the applicant must fill out an application and get fingerprinted. The Initial Applicant must successfully complete the new member course and pass the new member examination. After successfully passing the applicant will be issued a new Member ID Number and will be placed into Approval Pending (AP) status until their PSI is adjudicated. Starting February 1, 2018 new Auxiliarists under AP Status must pass the Basic Qualification Course II which consists of seven tested modules based on the Auxiliary Manual before they can be granted any higher status. If the PSI is favorably adjudicated the Auxiliarist may be eligible to be placed into Initially Qualified (IQ) Status, and those who have an unfavorable PSI adjudication will be disenrolled from the Auxiliary. Members in IQ Status are not eligible for Basically Qualified (BQ) Status until they have successfully completed all required mandatory training. After all mandatory training has been completed the Auxiliarist may become eligible for BQ Status. Beyond that if the Auxilarist in BQ Status completes a rigorous course of study they can achieve the Operational Auxiliarist (AX) Distinction. Auxiliarists with prior service are likely to have a smooth transition into their flotilla as they are able to come up to speed with current Coast Guard Auxiliary responsibilities and military customs. Prior service in the United States Armed Forces such as military service insignia, badges, ribbons, and devices earned may potentially be worn on the Auxiliary uniform based on what is approved in the Auxiliary Manual. Operational Auxiliary Program (AUXOP) is an advanced training program available to Auxiliarists. This program has been in existence since 1952 and was established under leadership of National Commodore Bert Pouncey. AUXOP was created to better assist the Coast Guard to fill needed skill sets and to assist with operational Coast Guard missions. In order to achieve the Operational Auxiliarist distinction seven credits must be completed from three different types of courses. Core, Leadership, and Electives are the different required course types. Specialty courses in weather, seamanship, and communications are required in the core curriculum that are all good for a credit each. An additional four credits are required under the leadership and elective course types. Upon completing the training program the Auxiliarist is entitled to wear the AUXOP Device. AUXOP advanced training also helps the Auxiliarist to increase their support capability and capacity to assist with operational missions for the Coast Guard. Auxiliarists are required to complete six mandated training courses within their first year of joining the organization, and then must complete them all again every five years after. These six courses cover Fundamentals of Security, Suicide Prevention, Privacy, Sexual Harassment & Assault Prevention, and civil rights awareness. In addition, Auxiliarists must complete influenza and ethics awareness just once in their career using the Coast Guard Auxiliary Learning Management System. Failure to complete the Mandatory Training may make the Auxiliarist ineligible to participate in Coast Guard Auxiliary exercises, drills, or response events. The Coast Guard Auxiliary requires Auxiliarists to take mandatory Incident Command System (ICS) courses. Four of the Incident Command System (ICS) courses are offered through FEMA's Emergency Management Institute (EMI) and another course if offered through the Auxiliary Learning Management System. Auxiliarists are expected to take courses that will help them to understand the Incident Command System's organization, basic terminology and common responsibilities. Auxiliarists are required to acquire the skills necessary to perform in an ICS support role. Officers, certified coxswains, pilots, or those in a leadership role may need to take additional EMI courses pertaining to the National Incident Management System and/or the National Response Framework. As part of ICS Training, all Auxiliarists must respond immediately to Emergency Response Alerts and participation in mandatory. Note: ICS-100 and ICS-700 are part of the Mandatory Training requirement. The Coast Guard sponsors over 15 different advanced training courses for Auxiliarists to take at C-Schools. Selection to attend a C-School is competitive due to limited availability, and the training is for Auxiliarists who want to be promoted in their levels of responsibility. To attend a C-School course the Auxiliarist must first be approved by their DIRAUX who will issue then issue official orders to the Auxiliarist. When an Auxiliarist is attending a C-School course their lodging and per diem are typically reimbursed by the Coast Guard. C-School opportunities include Leadership training which are offered at three levels: AUXLAMS (Leadership and Management), AMLOC (Mid-Level Officer Course), and AULOC (Upper-Level Officer Course). Auxiliarists may register and participate in the Naval Postgraduate School Center for Homeland Defense and Security Self Study Courses. As of 2019 over 10 online courses are available. While assigned to federal duty, Auxiliarists are considered federal employees for the purpose of civil liability; therefore, individual Auxiliarists are protected against being sued directly in many tort, property, and injury cases arising from their official duties. A handful of states offer limited employment protection for members of the Auxiliary who are called to assist emergency responders following a disaster or to attend to other Auxiliary matters. Auxiliarists who work for the state of Missouri are entitled to a leave of absence totaling fifteen days per year (with this upper limit waived in the event they are responding to a state or national declared disaster or emergency). Aside from being protected from termination as a result of their absence from work, they are also guaranteed protection against loss of time, pay, regular leave, impairment of efficiency rating, or of any other rights or benefits to which the employee would otherwise be entitled. State, city, and county employees in the state of Arkansas who are Auxiliarists are also entitled to a leave of absence to respond to emergencies, limited to fifteen days per calendar year. During their deployment, they are protected against loss of seniority rights, efficiency or performance ratings, promotional status, retirement privileges, and life and disability insurance benefits, and any other employment benefits. These government employees may not be required to use their vacation time to cover their absence. State, city, and county employees in the state of New Jersey who are Auxiliarists are entitled to a leave of absence, the first five days of which must be paid, to attend state or national conventions hosted by the Coast Guard Auxiliary. The employee's job is guaranteed upon their return. Adm. Robert J. Papp Jr. (right), commandant of the U.S. Coast Guard, presents a Coast Guard auxiliarist with the Coast Guard Auxiliary Commendation Medal in 2013. An auxiliarist piper in highland dress uniform performing as part of the Coast Guard Pipe Band. The Coast Guard Pipe Band is composed of active duty, reservists and retired members of the U.S. Coast Guard and members of the U.S Coast Guard Auxiliary. A Coast Guard Auxiliary safety patrol in Portland, Oregon in 2014. Two Coast Guard auxiliarists review performance qualification workbooks in Portland, Oregon in 2013. Auxiliary units conducting helo ops on the San Francisco Bay. A U.S. Coast Guard auxiliarist (right) provides English-to-Spanish translation for a member of the Dominican Republic coast guard during Tradewinds 2013, a U.S.-led multinational military exercise in the Caribbean basin. Andrew Niquette American politician and activist, one of the youngest National Delegates to the 2016 Democratic National Convention in American history. Since the establishment of the Coast Guard Auxiliary, a number of Auxiliarists have perished in the line of duty. ^ Schultz, Karl (1 June 2018). "The Commandant of the United States Coast Guard - Auxiliary Policy Statement" (PDF). Retrieved 6 June 2018. ^ Schultz, Karl (June 1, 2018). "The Commandant of the United States Coast Guard – Auxiliary Policy Statement" (PDF). Retrieved June 6, 2018. ^ "About the Auxiliary". U.S. Coast Guard Auxiliary. http://www.cgaux.org/. Retrieved July 29, 2009. ^ "National Safe Boating Week – Why?". Atlantic Maritime Academy. http://www.atlanticmaritimeacademy.com/bringingithomesafely09.html. Retrieved July 29, 2009. ^ "Public Law 85-445". The Library of Congress. https://www.loc.gov/index.html. Retrieved July 29, 2009. ^ a b Bonner, Kit (2004). 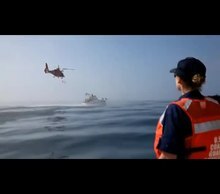 Always Ready: The U.S. Coast Guard. Zenith. p. 25. ^ Zukunft, Paul F. (June 24, 2014). "COAST GUARD UNIT COMMENDATION". USCG Office of Auxiliary and Boating Safety (CG-BSX) Auxiliary Division (CG-BSX1)--Items of Interest. USCG—Department of Homeland Security. Department of Homeland Security. Retrieved August 6, 2014. ^ Coast Guard Auxiliary Interpreter Corps (PDF). U.S. Coast Guard. 2011. pp. 1–4. ^ "United States Coast Guard Headquarters Organization". United States Coast Guard. Retrieved March 2, 2012. ^ "United States Coast Guard Auxiliary Organization". United States Coast Guard Auxiliary. Retrieved August 26, 2015. ^ "United States Coast Guard Auxiliary Deputy National Commodores". United States Coast Guard Auxiliary. Retrieved March 2, 2012. ^ "United States Coast Guard Auxiliary National Staffing" (PDF). United States Coast Guard Auxiliary. Retrieved November 6, 2014. ^ a b c d Auxiliary Manual. ^ "USCGAux Insignia of Office: Flotilla, Division, District and National Offices". United States Coast Guard Auxiliary Division. May 7, 2013. Retrieved June 18, 2013. ^ a b "Auxiliary Awards". United States Coast Guard Auxiliary. Retrieved May 29, 2017. ^ "USCG Auxiliary individual development plan" (PDF). USCG Auxiliary. June 1, 2016. Retrieved February 4, 2018. ^ "USCG Auxiliary Mandatory Training" (PDF). USCG Auxiliary. June 3, 2015. Retrieved February 4, 2018. ^ a b "USCG Auxiliary Mandatory Training from Official website". USCG Auxiliary. February 4, 2018. Retrieved February 4, 2018. ^ "Incident Command System 100". FEMA. February 4, 2018. Retrieved February 4, 2018. ^ "Incident Command System 200". FEMA. February 4, 2018. Retrieved February 4, 2018. ^ "Incident Command System 700". FEMA. February 4, 2018. Retrieved February 4, 2018. ^ "Incident Command System 800". FEMA. February 4, 2018. Retrieved February 4, 2018. ^ "Incident Command System 210" (PDF). USCG Auxiliary. February 4, 2018. Retrieved February 4, 2018. ^ "14 U.S. Code § 823 (1996)". Legal Information Institute. October 19, 1996. Retrieved February 15, 2018. ^ "Mo. Rev. Stat. § 41.1005 (2012)". State of Missouri Revisor of Statutes. August 28, 2012. Retrieved February 15, 2018. ^ "AR Code § 21-4-104 (2016)". Justia. 2016. Retrieved February 15, 2018. ^ "NJ Rev Stat § 38:23-2 (2016)". Justia. 2016. Retrieved February 15, 2018. ^ ECU, ECU. "Leif Erickson and a U.S. Coast Guard Auxiliary member in a marina". ECU. Retrieved December 21, 2018. ^ Wilson, Rande. "Al Roker – Honorary Commodore – United States Coast Guard Auxiliary". COAST GUARD Auxiliary Live. U.S. Coast Guard Auxiliary. Retrieved September 3, 2014.